I had no idea what to expect when Hat Trick hit the market. Would people buy it? Would they like it? I wrote the book I wanted to write, but would it be what people wanted to read. I’m thrilled some very positive things have happened this week. There’ve been some great reviews on both Amazon and Goodreads as well as some individual readers (like Solarcat) posting to their own site. (For all the latest reviews and articles on Hat Trick, you can check here.) It’s been great to read what people have had to say and I’m glad they are enjoying the book. I’m appreciative that some of the reviews have had some constructive criticism as well. It’s given me some things to consider as I work on new writing projects, including potential Hat Trick sequels. Wednesday was a huge day as Outsports.com posted “New novel ‘Hat Trick’ features gay high school hockey romance.” Doug and Craig from PuckBuddys.com helped make that happen and I can’t thank them enough for having faith in the book to make this possible. It’s an honor to be featured on Outsports, which also happens to get a shout out in Hat Trick. 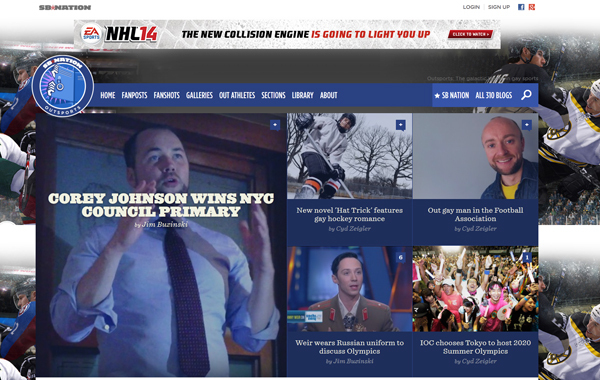 Here’s how it was featured on the site’s home page Wednesday morning (it’s still on the homepage today, just further down). The week was significant on Amazon too. 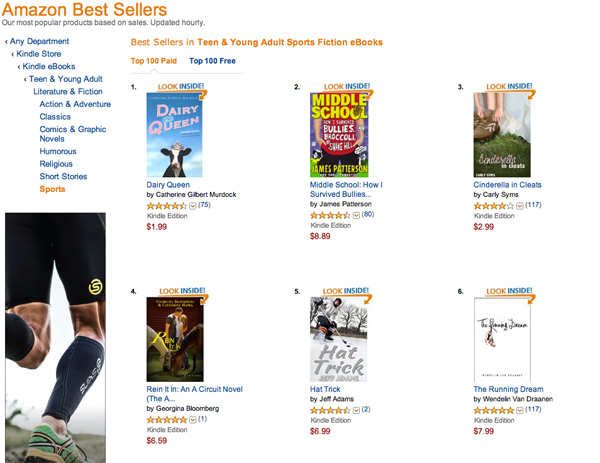 I posted on Tuesday that Hat Trick had cracked top 15 in its primary category: Kindle Store > Kindle eBooks > Teen & Young Adult > Literature & Fiction > Sports. The Outsports article gave it a great push. I’ve seen it as high as #5 (which I captured in the screenshot below) and it’s spent the majority of the time since in, or within a couple spots, of the top 10. 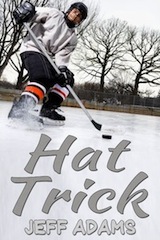 The Hat Trick paperback also hit this week, a couple weeks ahead of schedule. I’m looking forward to seeing one in person, which will probably happen during the coming week. Speaking of paperback, there’s the chance to win a proof copy over at Goodreads. There’s still more Hat Trick stuff planned in the coming weeks–keep an eye on Twitter and Facebook for details! I’m looking forward to seeing what happens next as news of the book keeps coming out. Thanks to everyone whose helped make this week so incredible!